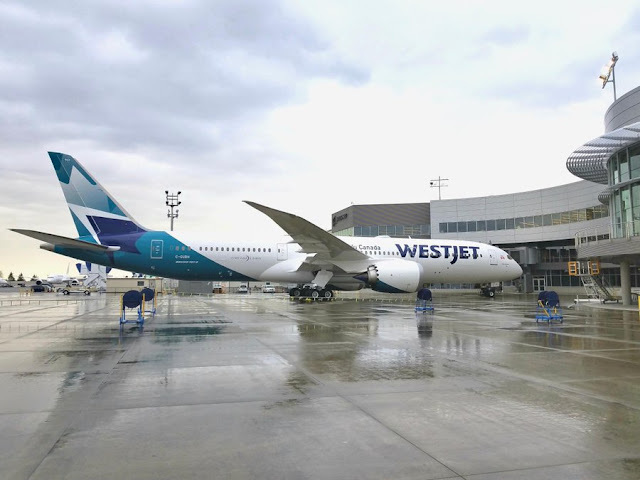 Canadian airline, WestJet announced January 2019 traffic results this week with a load factor of 80.5 per cent, a decrease of 2.1 percentage points year over year. Revenue passenger miles (RPMs), or traffic, increased 2.7 per cent year over year, while capacity, measured in available seat miles (ASMs), grew 5.4 per cent over the same period. WestJet welcomed an additional 28,000 guests in January, a year over year increase of 1.4 per cent. In January, WestJet welcomed the arrival of its first Boeing 787 Dreamliner, ushering in a new global era. WestJet's Dreamliners feature the airline's first lie-flat business cabin seats accompanied by luxurious blankets and pillows, turndown service and in-seat TVs, offering a premium service with a distinctly Canadian feel. The first Dreamliner will fly guests domestically on Toronto/Calgary routes starting February 20 before the first international service from Calgary to London (Gatwick) on April 28. WestJet also recently announced new non-stop service to Austin, Texas and Portland, Oregon from Calgary this spring. These key markets will help to diversify Alberta's economy, open new trade links and forge stronger connections between Alberta and major global destinations.